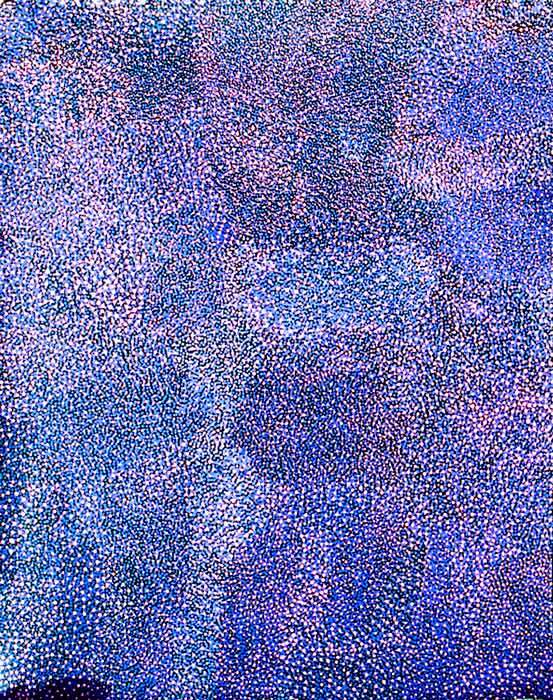 Josie Petrick Kemarre commenced painting around 1990 and is the niece of the late Emily Kame Kngwarreye. Josie's first job was working at the Santa Teresa mission as a chef. She met her late husband, Robin there, and after her bush marriage moved with him to an area of Utopia called Mt Swan. Josie has 7 children and also raised her sister’s son. Josie has worked as a translator for the Central Land Council. Josie’s paintings are intimately associated with women’s awelye ceremonies (ceremony/dancing) and women’s ancestral stories. Based on the native plants of her homeland and her favourite bush tucker species in their various stages of growth, Josie’s aerial depictions of Bush Tucker feature overlapping dots with only a semblance of Indigenous iconography, while her Bush Yam Dreaming paintings are explosions of wild colour. In her Women’s Ancestral Dreamings Josie includes iconic symbols and dots in different colours. These Dreamings depict the landscape and the seasonal cycle of the wild bush berry in the barren desert landscape, transformed into abundant vegetation after rain. Women gather these edible bush berries when ripe, as they are a valuable source of nutrition, and can be ground into a paste and dried. Women’s ceremonies for these Dreamings ensure fertility, regrowth, food abundance and increase in subsequent seasons. Embassy of Australia in Washington DC.